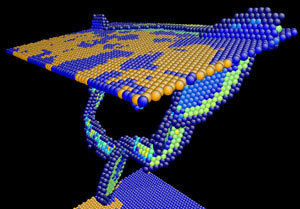 (Nanowerk News) The enigmatic ability of ‘nanotwinned’ metals to display disparate physical properties—ultrahigh strength and ductility—has been explained by YongWei Zhang and David Srolovitz from the A*STAR Institute of High Performance Computing, Singapore, and National University of Singapore graduate student Zhaoxuan Wu ("Dislocation–twin interaction mechanisms for ultrahigh strength and ductility in nanotwinned metals"). The key lies in understanding how different types of dislocation propagate through nanotwinned metals in a manner not seen in bulk materials. Metals can be made stronger if they are refined to have very small crystal grains. Unfortunately, these fine-grained metals also lose some of their toughness, meaning that they may break easily when deformed. In recent years, researchers have discovered that this problem can be partly resolved by introducing nanotwinned crystal grains. At the boundaries between these grains, the atomic structure on one side is a mirror reflection, or ‘twin’, of the other. When a nanotwinned metal is subjected to stress, the twin boundaries block dislocations—defects in the crystal structure that are the carriers of deformation—from spreading throughout the metal, thus providing very high strength. However, the same samples also show excellent ductility, meaning they can be squashed and stretched without breaking, which generally requires a high density of dislocations. Fig. 1: Two parallel atomic planes representing ‘twin boundaries’ between copper crystal grains. A dislocation can be seen passing through the upper twin boundary and generating a low-mobility dislocation in the lower grain. They found that dislocations could sometimes move across twin boundaries, but this required unusual dislocation reactions and the motion of normally immobile dislocations (Fig. 1). In essence, the boundaries generally block the motion of dislocations, but are not completely impenetrable. In particular, the interaction of dislocations with the twin boundaries give rise to ‘Lomer’ dislocations, which dissociate into three other types called ‘Shockley’, ‘stair-rod’ and ‘Frank’ partial dislocations. The Shockley partial dislocations provide additional slip deformation in the crystal that contributes to ductility, while the stair-rod and Frank partial dislocations act as ‘dislocation locks’, preventing further migration of the dislocations and providing high strength. This means that, paradoxically, the metal acquires its versatility by having both a high density of dislocations and significant barriers to their motion. “Armed with this information, we can identify how to alloy the material to the desired strength for particular applications and develop new material systems for which this deformation mechanism will be even more effective,” says Zhang.